I finally get to the bottom of the fifth season of the 1987 Teenage Mutant Ninja Turtles cartoon produced by Fred Wolf. 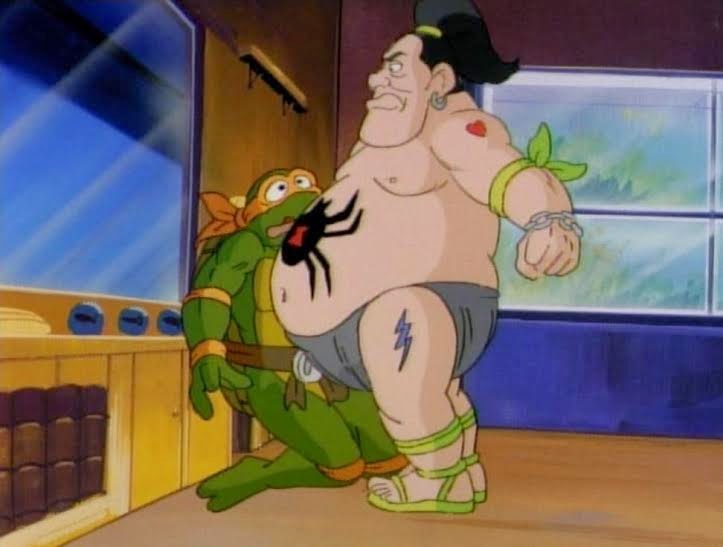 TMNT Season 5, Part 4 review at Adventures in Poor Taste. In these adventures, we get our one and only appearance from Wingnut and Screwloose, but more importantly, we get the big "Planet of the Turtleoids" primetime special. Is it as good as I remember it? Nothing ever is, but I love it anyway. Also, update on the image fiasco: I'm almost done. I only have to get through the rest of the Image TMNT series and restore one more article (the TMNT & Other Strangeness overview) and we'll be back to normal. Groundchuck and Dirtbag seemed like they were originally intended to be a big deal. They got a debut in a 1-hour episode, they were bosses in TMNT III for NES (why they were chosen over characters like Rat King is telling), they get another episode in Season 7 and of course they got toys. I always figured these two got overlooked simply because Rahzar and Tokka were the more popular secondary mutant pair after Bebop/Rocksteady. There's no room for 3 sets of villain mutant pairs, so Groundchuck and Dirtbag faded away into obscurity after the original toon ended, while Rahzar has made a comeback and Tokka might as well. I suppose its possible for Nick to bring them back, but they probably won't look anything like their old incarnations if Rahzar is anything to go by.